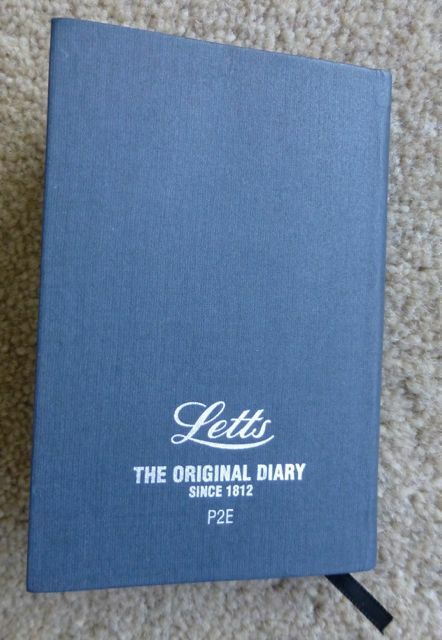 How many of us still use paper diaries to schedule our working and personal lives? Not many now I suspect. Google, Outlook, iCal and all the other host of online calendars now available control us. Frequent meeting invitations are emailed directly to us, perpetually popping up on our smartphone screens, pretending to be text messages. The week-at-a-glance always seems to fill up with overlapping coloured blocks of scheduled meetings. And Doodle has become the default tool for many of us now, commiting even more of our precious ‘free’ time to ever more meetings, way into the future, often weeks and months ahead. Sometimes, my dean’s calendar is so chocker that he can only meet before or after hours (i.e. before 9 or after 6) several weeks down the line. Imagine what it would be like to turn the clocks back; wake up one day and have a completely, meeting-free, workday. Whilst being away from my workplace, on my dream fellowship, I have tried to find ways of letting this happen again. To help, I deliberately chose to stop using my online calendar, temporarily, and instead bought myself a small Letts diary for 2013, which proudly claims on the back to be “the original diary since 1812” and has the London underground map on the back two pages. Inside, there are two days per page with 10 thin lines for each and a black ribbon that can be inserted between the pages to allow it to be opened easily for that day. I have been using a thick italic felt pen to fill it in since January. A day can easily get full after two appointments have been added. Then there is no more space and that signifies that my day and evening are booked. This simple physical constraint restricts me from getting overloaded. My Australian friends find this new-old way of planning hilarious. But for me, it is a real joy. Instead of clicking each morning on my Google Calendar and trying to think through what is in store for all of my many meetings scheduled for that day, and to see if I might squeeze one more in, I occasionally scribble down, in my unaccustomed and ungainly handwriting, the odd event. 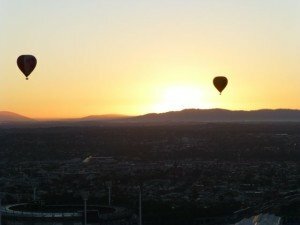 A ‘busy’ day might read an 11.00 a.m. coffee with X, followed by a 12.30 p.m. lunch with Y, ending up with meeting friends for a ‘footie evening’ (watching a local derby game of aussie rules with 80,000 others at the Melbourne Cricket Ground). Some days my diary is completely blank giving me the freedom to decide what to do all day from the moment I wake up. On such a day, I might start by watching the sunrise and the hot air balloons go past my balcony. Then to work at 7.00 a.m. catching up on the emails; then for a morning swim, followed by a coffee at the local café at about 10.30 a.m., or later, depending on what takes me. Then down to a solid hour or more of work, before having lunch at a café on the riverside. Then take the tram to the university and see who is around to chat with about our respective research ideas. What might happen is down to serendipity. Then some more hours spent reading and writing, finished off by a delightful walk in the botanical gardens, before thinking about dinner and a glass of something. All the time, when not in meetings, I am thinking and letting my mind wander in unexpected ways. Having the freedom to indulge in time and thought in this unfettered way is, sadly, a luxury for most of us in the modern academy. Normally, I am constantly aware of the pile of work that envelops me – together with my never-ending and always expanding to-do list. To be freed from all of that – albeit just for a few weeks this time – especially the tyranny of the online calendar has been an invigorating experience. With back-to-back meetings, one never has time to reflect or think about what one suggested or agreed on in one meeting before the next one comes along with a trainload of new demands and challenges. Having only the occasional meeting in a day allows one the freedom to push one’s mind in new directions. 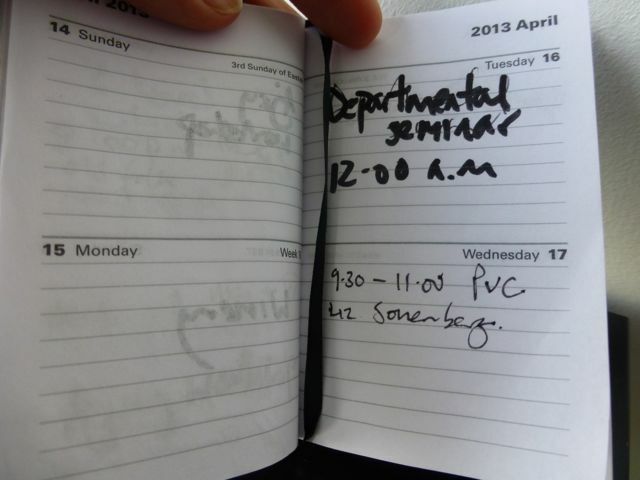 There is also something quaint about writing down an appointment in a little book – just for yourself. 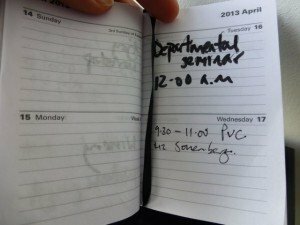 Paper-based calendars, however, can be as controlling as their online counterparts, depending on whether they become public. 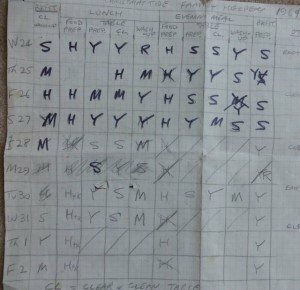 My sister-in-law came across a paper-based rota, when clearing out stuff, that my parents had written for each family member’s chores over the Christmas Period of 1969 (when I was a wee child)! We were a large family of 4 children with various other people staying during that time. 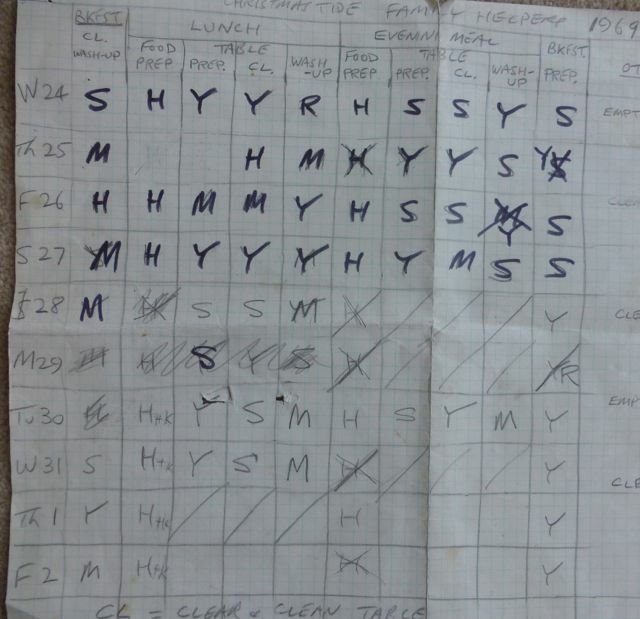 To help my parents, we were each given tasks to do each day over the 10-day period. Mine included preparing and clearing the table for meals, washing up and breakfast prep. The handwritten and meticulously worked out rota was stuck on the kitchen door for all to see and be checked off by. Looking back at it now reminds me of how powerful it was in managing us all. There were no fights; just shouts of ‘your turn’ and finger pointing at the rota. I wonder if this regimented orderliness was peculiar to our family or other families had their own variant of ‘Alles in Ordnung’ plastered on their walls, too. Nowadays, there are all manner of online family calendars like cozi claiming that they will “manage your whole life”. That is scary. At least our managed family life was only for Christmas.